Just inland from the Redwood Coast lies the Klamath Region, a little-known corner of Northern California with winding rivers, granite canyons, majestic mountains and miles of hiking trails waiting to be explored. Our riverside cabins are on the banks of the Klamath, with private swimming, a peaceful setting and lots of good fishing access. Enjoy the view of the river from your private deck and sleep with your door open to the sounds of the river. The warm, sunny interior of the Klamath offers an alternative to the cool and foggy Redwood Coast, and you'll be far from the crowds. Our redwood, pet friendly cabins come with a full kitchen & linens and a deck that looks over the river. We have farm fresh eggs and fresh goats milk seasonally available, and kids love helping out with the morning milking. We can arrange whitewater rafting trips, point you in the direction of the best hiking, or you can just relax by the river and explore on your own to see what you find. You won't be disappointed. We're excited to be hosting three workshops by the Siskiyou Field Institute this Spring: Botanical Illustration with Linda Ann Vorobik, Natural History of the Klamath River from a Raft, with Max Creasy and Craig Tuss, and Geology of the Klamath River Canyon withe geologist Bill Hirt. See our Events page for more details. Register for the events with the Siskiyou Field Institute, and contact us at mail@sandybar.comfor lodging. 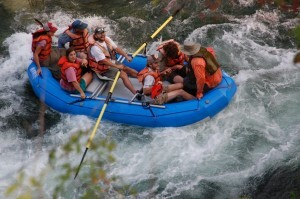 Whitewater rafting on the Klamath River. We recently finished a Guide to Sandy Bar Ranch and the Mid Klamath, which has information on the natural and cultural history of this region, along with descriptions of hikes and destinations in this region. Each cabin has a printed copy, but you can download a digital version to have on your own device. Our cabins are open year round. During our peak vacation seasons, (mid-June through August and mid September through October) we give preference to full week bookings You can book or check availability from our website, send us an email mail@sandybar.com , or give us a call at 530-627-3379. The Redwood Coast, 2018 'Best in the U.S."
The North Coast of California has hidden coves, majestic Redwoods and miles of secluded beaches. Voted number one in Lonely Planet's 2018 "Best in the U.S." destinations, the Redwood Coast offers hiking, beachcombing, quirky culture and unparalleled scenery, with only one drawback: it's foggy and cold for most of the summer. We're located just inland from the Redwood Coast, without the fog and crowds of the summer tourist season. Our favorite and most direct route to the coast is over Bald Hills Rd., which connects to Redwood National Park, and one of our favorite stretches of the north coast, including Ladybird Johnson Grove, Fern Canyon, Prairie Creek Redwoods and Gold Bluffs Beach. The drive takes about 1 hour and forty five minutes, and winds through the beautiful grasslands of upper Redwood National Park, a seldom-visited corner where you're likely to spot elk, deer, bear and hawks. The route includes an eight mile unpaved section which may be bumpy certain times of the year, but is kept in good condition, even for 2-wheel drive low clearance vehicles. For more info on this route see our Directions page.